Municipal waste management in Poland has changed dramatically since the early ’90s when, as part of Poland’s privatisation program, municipal authorities were freed of their waste management obligations. The combined Polish recycling rate for dry recyclables and organic waste has increased from 5% in 2004 to 21% in 2010, according to a Copenhagen Resource Institute (CRI) study Municipal Waste Management in Poland (2013). Another source provides similar, corroborating statistics, putting the dry recycling rate in Poland at 14% and the composting rate at 7%. The latest Eurostat data (for 2011) shows that the upward trend continuing, with the total recycled and composted reaching 28%. That is rapid rate of improvement, but leaves Poland well below the latest EU-27 average of 40% (25% recycled and 15% composted) – so what prospect is there of Poland reaching the EU’s mandatory 50% target by 2020? Responsibility for waste disposal shifted to householders, who were left to individually contract any waste collection company of their choice. In the hard economic climate a ‘cheaper-the-better’ mentality prevailed, which did little to encourage sustainable practices. There wasn’t even an obligation on householders even to sign up for waste collection. Act on management of packaging and packaging waste (2013). The first of these was revolutionary in that it gave responsibility for municipal waste collection and disposal back to municipalities. Now they are required to organise garbage collection and the separate collection of biodegradable waste and recyclable materials such as paper, metal, glass and plastic. It is expected that the new law will improve waste management control measures on a local level and greatly reduce the illegal dumping and trash burning. The Act on Waste helps tackle the previous ‘free for all’ amongst collectors – it obliges waste handlers to act in a manner consistent with waste management principles and plans adopted at national level (by the Council of Ministers), regional level (Voivodeship) and local level (Municipality). Poland has also this year adopted a new National Waste Management Plan, which states that an essential step towards improving the recycling rate in Poland is to increase landfill fees for recyclable, compostable or recoverable material. If acted upon, this could greatly increase the incentive to divert important municipal waste streams from landfill. 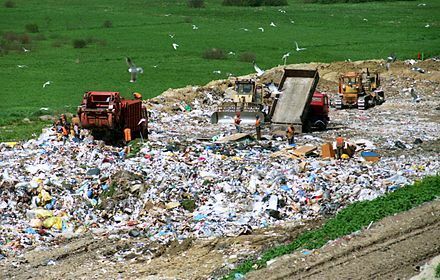 The Polish market is clearly responsive to cost: in 2008 after landfill tax was significantly raised, there was a substantial reduction in waste being landfilled. The number of cubic metres of water used by the household per month. The first of these options seems to be the most reasonable and has proven the most popular. Municipalities are left to determine the standard collection fee, which as a result varies from region to region. Some municipalities charge at little as 3 Polish Zloty (around £0.56) per household, per person, per month, while some charge 20 Zloty (around £3.75). The standard charge is also affected by a declaration made by the householder regarding waste segregation. If a property owner declares that they have separated out recyclable materials then they pay considerably lower fees. In some municipalities, this could be as low as 50% of the usual charge. Only those who declare that they don’t want to recycle pay full price. It’s rare that people do so: who would pick the most expensive option? The problem is that some householders declare that they recycle their waste while in reality they don’t. Unfortunately, abusing the system is easy to get away with, especially since the new scheme is still in its early stages and is not yet stable. Monitoring recycling participation in order to crack down on such abuses of the system represents quite a challenging task. Transformation periods are always hard and it is common that they bring misunderstanding and chaos. It isn’t surprising that there are problems with the new system which require ironing out, and the new legislation is nevertheless welcome. However, there is still much work to be done to provide sufficient and sustainable waste management in Poland. This will include such measures as educating the population, improving waste separation at source and securing waste treatment capacity. Perhaps most importantly, Poland needs to take immediate action to develop its municipal waste treatment capacity across the board. If the 2020 recycling target is to be met, the country will require material recovery facilities, anaerobic digestion and in vessel composting sites, and household waste and recycling centres; and if more waste is to be diverted from landfill it will also need energy from waste (EfW) incinerators and mechanical biological treatment facilities. According to Eurostat, only 1% of waste in Poland was incinerated in 2011. It has been confirmed so far that an EfW plant will be developed in each of Poland’s 11 biggest cities. Fortunately for Poland, the development of waste treatment installations is quite generously funded by the EU, which covers up to 80% of the total cost: EU subsidy agreements have already been signed for three of the planned EfW plants. The remaining cost will be covered by central, regional and local government. The CRI paper presents three different scenarios for the future recycling rate in Poland. One of them is very optimistic and predicts that Poland has a chance to meet the 2020 recycling requirements, but each is based simply on a regression analysis of recent trends, rather than an analysis of the likely impact of recent and planned policy measures. What it does make clear, though, is that if Poland continues to progress as it has since 2006, it will reach the 2020 target. How many EU countries can claim that? Note: The article is being republished with the kind permission of our collaborative partner Isonomia. The original version of the article can be found at this link.